Boil potatoes. Peel and skin and mash it. Add all the spices and mix it well. Take about 1 tablespoon mixture, wet your hands and make small balls. Prepare all the balls in the same way. For batter- Take a bowl. Add all the ingredients, water and make thick batter. Take a pan and heat oil. 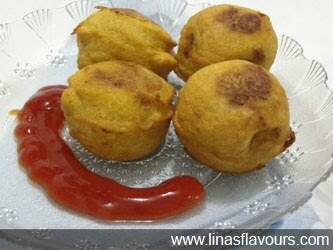 Take potato balls, deep in the batter and put it in the pan. Put 4-5 at a time and deep fry it. Fry all the vadas in batches. Serve it hot with tomato ketch up and green chutney.